I know there are other ways to do this, but this is how I replace doll arms and legs, if you can't just snap the limb back into the torso. Whichever piece is the "male"--the part with the knob--gets stuck in the freezer for an hour or two. Whichever piece is the "female"--with the hole--gets held over steaming water for a few minutes to enlarge it. Be careful not to drop the item in the hot water! Once the knob section is chilled--that is, it gets a little shrunken momentarily--I remove it from the freezer and at that point it is much easier to fit the two pieces together. Of course, this only works if both the pieces are not broken otherwise. Is Skipper's birthday Feb. 9? I've been trying to figure out just when Skipper turns 50, and I think I've found an answer. The other well-known figure introduced at the 1964 Toy Fair was GI Joe. Thanks to Google, I discovered the pages of a book by Karen O'Brien which mentions the history of Joe. O'Brien wrote that Joe was first shown at the fair on Feb. 9. I'm assuming that is also the day Mattel introduced Skipper. 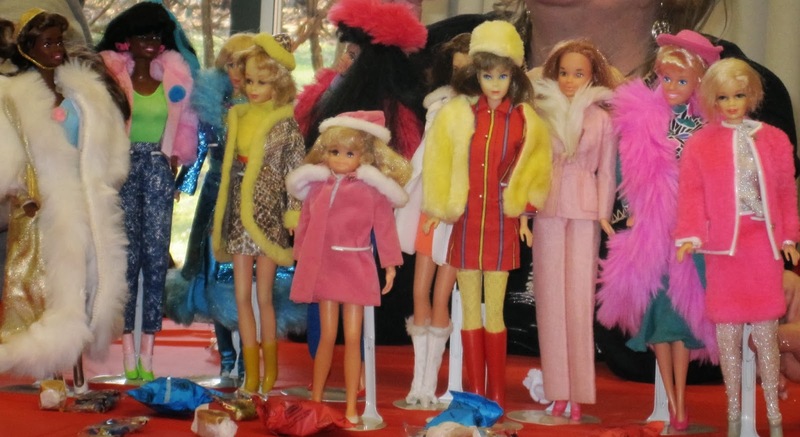 The Queen City Barbie Doll Club finally had its Christmas party on Jan. 12 (see, I'm not the only one behind on getting organized for Christmas). After the -30 wind chill we had on Jan. 6, I decided that my bundled-up dolls were going to the party with me. This isn't a Christmas outfit photo, it's a winter coat photo that Margie took. I had the 1968, 1969, 1970 and 1971 clothing booklets as a little girl. I remember wanting Maxi N Mini; Snake Charmer; Dressed in Velvet; Red, White N Warm; and Snug Fuzz back then. As an adult collector, Maxi N Mini, Snake Charmers and Snug Fuzz were some of the first outfits I bought. I was ecstatic to finally acquire Dressed in Velvet! I've always considered it Skipper's most decadent outfit. Where on Earth would you actually wear this? The only idea I've come up with is if you are going to the ballet or a play in Manhattan in December. Some collectors focus on lingerie, or ballgowns or wedding gowns. Why do I have an obsession with the heavy coats for Barbie and her family? Growing up in the American Midwest in the 1970s was very difficult during the winter. Ohio had its two worst winters in history in 1976-1977 and 1977-1978. Snow on the ground every day from January through May. Walking to and from the bus stop every day (my sister has never fully recovered from getting frostbitten fingers). Thinking that having icy cold hands, feet and ears for six months of the year is normal. No wonder my dolls have to get so bundled up in January! Today is Jan. 11. I realize that Christmas was 17 days ago. But two days ago I finally finished working on my current Barbie project, one that I had been working on since the second week of December. My hospitalization and recovery, the wacky weather, returning to work sooner than I expected, and yes, Christmas itself all intervened in my completing this project. I wanted to show ensembles from each decade that are actually meant for the holidays, although they were never advertised as such and their colors aren't necessarily red and green. Between Thanksgiving and Epiphany, you can also wear gold and silver, ice blue, deep purple and even black if it's very dressy. Barbie and her family and friends have many such outfits, and what I am going to show you is just a small sampling of what I've discovered will work as Christmas outfits. There are many, many more of these. These are just the outfits that I have complete or almost complete. The sets I have from the late 70s onward were for the most part purchased in their packaging, so I have the shoes and accessories, and the ones from the early 80s and after I bought new at the stores. It's only the stuff from 1960 to about 1976 that I don't necessarily have complete. Usually I have the shoes; it's the stocking or hose I have the hardest time finding, as you will notice in the photos. You will also notice that I don't have anything for the toddlers and grade-schoolers--there are only a few holiday outfits for them and I don't have them. I also couldn't find anything suitable for the Jazzie-size dolls. Ken has plenty, but I don't own any of them, and that is something I'm going to have to work on correcting! I've divided the outfits by decade. I noticed patterns as I started dressing my dolls. 1. The 1960s had lame' and velvet. 2. The 1970s had long wool skirts and fake furs. 3. The 1980s had jewel tones, sweater dresses and the richest-looking clothing of all of the decades. 4. Since the 1990s were the peak years of Barbie collecting for both children and adults, you will find many inexpensive simple items and others that are extravagant to the point of decadence. Some notes: I had way more dolls and ensembles from the 90s than I realized. After I took the photos for that decade I noticed that some of the dolls and clothes got hidden behind others. The blue rectangular box is a TV set that is actually an amusement park souvenir. The ceramic tree was a present made by one of my grandmother's friends for her in the early 1970s. The pink fainting couch is a very fancy jewelry box I bought at an antique mall. Unless otherwise noted, the dolls are wearing outfits from the same years of their release.